The demand to do more, with no additional resources, in the same or less amount of time is the world we live and work in now. This will not change except to say that demand for higher, better and more cost effective results will continue to increase. Uncovers the key skills and attributes needed for a more productive approach to your work, your life and your team. Explores which habits hinder or help your productivity and how these impact on your team and your workload. Helps you discover the ways you can amplify your productivity to bring new levels of achievement and success into your life, work and team. Shows you how you can engage and empower your team to truly drive performance and ramp up their productivity. Brian Tracy – Best Selling Author –Eat That Frog! Fill in your details and receive Chapter 1 of The Productive Leader for FREE as well as a stack of other great tools to help boost your productivity. In the future of work where having influence relies on self-leadership, delegation and high performance, those who are productive leaders will be the ones who thrive. Productive Leadership is the number 1 skill for every current and aspiring business leader to have in their tool-belt. Sally’s insights in this book are powerful and command attention. Two words- read it! I’ve just finished reading The Productive Leader and I’ve finally figured out where I’ve been going wrong all these years! As a lifelong learner, I’m always willing to review how I do things with a view to improving my work habits and lifestyle. I love this book, jam-packed with well thought out concepts, which are easy to implement and the best part…They work! Nice work Sally. Sally Foley-Lewis is the real deal. She practices what she shares in this book. She shares not only what works for her clients, but what she puts into practice to make her one of the most productive people I know. Her book is filled with practical ideas shared clearly and with humour. Your small investment in this productivity tool will pay off many times over — if you apply her techniques to your life. What I share with my clients is that as a leader, you need to achieve more by doing less. Sally’s book strongly reflects that principle. Productivity is so much more than time management. It is about leveraging your resources to achieve your highly focussed goals and Sally’s work embodies this. I am thrilled that Sally has been able to capture her work on the written page. As an absolute dynamo, it was only a matter of prioritisation to make it happen. As a speaker and a coach, she has enabled her clients to achieve fantastic results. The ideas she has shared in this book will boost her to the next level. Congratulations Sally on a book that is essential for every leader and potential leader to read and incorporate into their every day habits. Technology was supposed to make us more productive, but like building a house, unless you have a solid foundation, it doesn’t matter what program, app or plug in you use, you are unlikely to achieve long term, sustainable results. In a world full of information and “noise,” The Productive Leader cuts through the “fluff” and shines a light on the fact that if you don’t get the foundation right, nothing else matters. In this phenomenal book, Sally Foley-Lewis says, “It matters not what role you’re in or what your job title is. You are a leader. A leader is not a job title – it’s a behaviour.” This gem alone can transform the path of a human being. Sally is one of those people whose insights are powerful and command attention. Read. This. Book! I have been waiting for this book to be released. The Productive Leader, it says it all really: we all want to be just that in our lives. Step by step Sally takes us through just how to achieve that and so much more. From the moment I met Sally the one thing that struck me, apart from her intelligence, was her passion for helping people and companies to have a happier and healthier work place. She has a very clear vision on how she can help give back the valuable time we would all love more of. Her passion, leadership and brilliant organisational skills now make so much sense to me since reading her book. She has been passionate about organising the best for herself and those around her since she was a child. If you have a small business, a large company, are the CEO of a company, the head of a department, or are time poor in even running your own life, I highly recommend you grab your copy and read it very carefully, you will learn so much on how to become more effective in your daily life, all while getting back some precious time to spend exactly how you want to. As Sally says, you can work harder, or smarter and calmer, I know what I choose Sally, thanks. Sally, on a personal note I wish you every success with your book, you are one of the most caring, funny, authentic, real and smart women I know who deserves all the success in the world. What I love about Sally is her honesty. She genuinely and deeply understands the real challenges of leadership and organisation and her insights go far beyond the prosaic to the powerful. She also understands our inherent resistance to change, and to the criticism and rejection that people living in their power often experience from those who want to stay victims. If you are amongst the people who claim sovereignty over their own lives – and you want to help others do the same – you need to read this book to gain the strategies and systems Sally shares. And book her to speak to your teams. She’s good. I’ve always been in awe of Sally’s processes, lists, plans, posters, journals, etc. She knows how to get things done, and she gets on with it. Now I know this ‘bossy and organised’ trait is something she’s had since childhood. Well, all I can say is … it works! With so many distractions today, longer than ever to-do lists, and stress on the rise, we could all do with some help. Sally breaks down her expertise and processes into an easy-to-read format. If we all follow her advice, we would have a lot more productive leaders around! 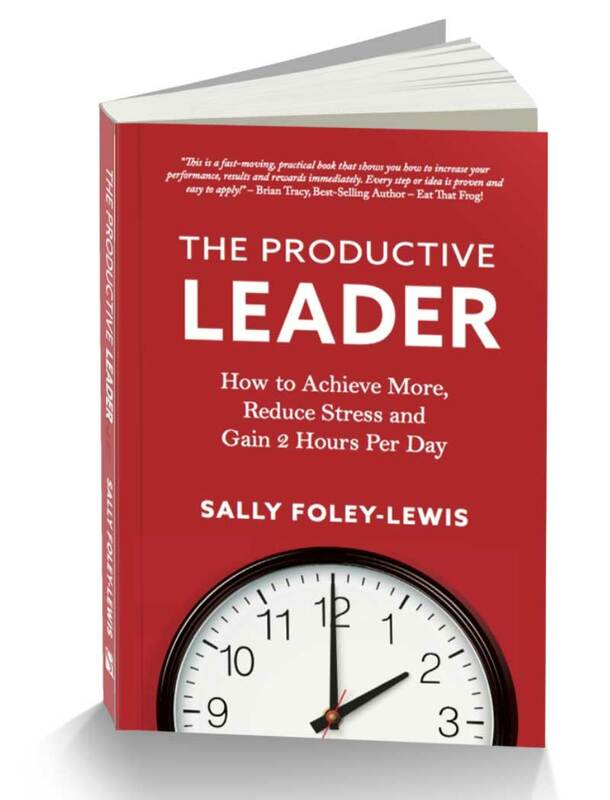 Sally Foley-Lewis has written the penultimate book on productivity! Cleverly crafted with real world strategies that you can implement in a matter of minutes. It will be become an all time classic reference book for the modern leaders of business. Well Done … 10 out of 10! What if you could read a book and get back two hours in every workday? That is a reality when you read Sally Foley Lewis’s excellent book, The Productive Leader. Sally teaches you how to work smarter and calmer, which beats working harder every day of the week! Highly recommended. Sally has written a book that is extremely readable, packed with case studies and examples. Gone are the days where productivity is equated solely to time management. Sally shares how productivity is about “focusing on the effectiveness of your efforts” and she offers practical tools to change our behaviours so we can increase our personal productivity and the productivity of the people we lead. If you also want to be a productive leader, then this is the book for you. Who has time to be more productive? I’m too busy! Feel lighter, less stress and learn to become more accountable for results with “The Productive Leader” by Sally Foley Lewis. Sally’s capacities to unpack, explain, and advise on how to be a more productive leader is captured in these pages. Loved your insights and the way they were delivered with a combination of story telling and statistics. I could see myself in your examples and what I can see I can take action on. Productivity has increased and time has been saved. Thank you! Sally is one of those people whose insights are powerful and command attention. She has shifted my thinking – the result … I’ve found another hour in most days to focus on income producing activities and created an extra 30% sales in only two months. What a return on the investment! Read this book!